Wow, this has been such an amazing week! 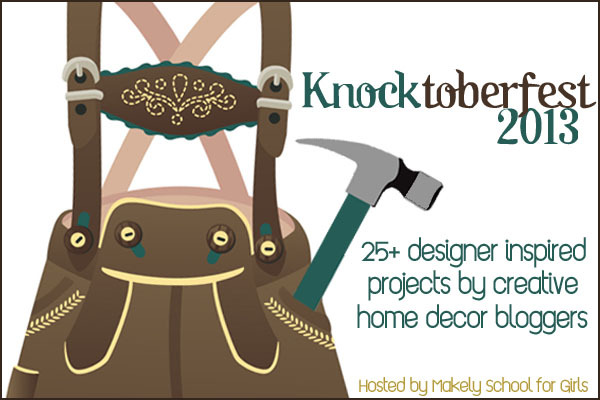 The Knocktoberfest bloggers have been truly inspiring with their designer knockoff projects. I can’t wait for you to check them all out! And if you’ve missed Days 1-4, be sure to click here to see them all! Thank you for following along all week! I’m considering doing a linky party for all of YOUR knock off projects. Would anyone be game for that? Wow, this has been such an awesome series!!! Thank you so much for putting it together. I have a number of new projects to do now! Thanks, Catherine! I’m glad you enjoyed it! It is, isn’t it? LOVE that lamp!